Funky Cordoba i Córdoba, Spanien: Reservér nu! Cancellation policy : a penalty of 20% if you notify us 15 days prior to the arrival date and 100% if you notify us less than 15 days prior to the arrival date. The cancellation must be transmitted to us by email and we have to confirm you the cancellation by email in order to be valid. 20% At confirmation and 80% 15 days before arrival. Our Group Department will contact you and give you our data bank details. We specialize in offering accommodation to Erasmus students. Check our deals for short and long stays with our multilingual staff. We are in the historical center. All our rooms are ensuite. We have wifi in every floor, common areas, terrace and kitchen. When you arrive at the hostel we will welcome you, answer your questions about this mysterious city. When you have built up an appetite we will advise you of the best eating and drinking spots round town. When you are curious to see Cordoba's history we will give you maps to assist you in exploring and learning about this famous city. When you are all worn out and need a place to just kick back and relax, come back to Funky Cordoba for a drink and a chat....take time to enjoy our nice view of the Mezquita from our terrace, only a five minute walk away. Stay at funky Cordoba and you'll enjoy a good environment for meeting other travelers. Become a part of our small family! Personal contact is important for us. We can help you plan a walking tour in town or a hiking in our beautiful mountains. Take time to enjoy a thermal bath and massage or to visit the nearby village, Almodovar del Río, and of course Medina Azahara. 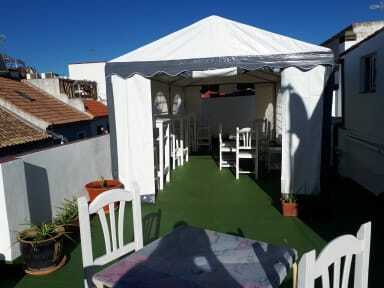 Why not book a week with us here at Funky Cordoba, for all your adventure, cultural and gastronomic needs. We can offer you a special price for an extended stay, and do not forget to visit our other two hostels, Funky Fes, in Fez and Al Andalusí in Tangier (Morocco). Book three nights and we´ll offer you a FREE FOURTH NIGHT. The complimentary fourth night is subject to availability. If you would like to use this offer, please contact us, and we´ll make everything possible so that you can enjoy your stay in our lovely property a little longer. Stay with us and we will help you to get settled in Cordoba! We have adds for apartments, free maps and campus information for you. Also we are flexible with cancelling or extending your reservation. Check-in 14h (2pm) to 00.00.